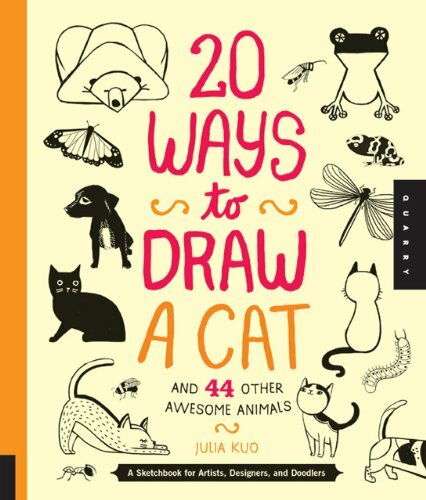 20 Ways to Draw a Cat is a fun animal drawing book. Besides cats, there are also a lot of other animals you can draw, such as giraffes, tigers, frogs, snails, whales and many more. For each animal, there are 20 illustrated examples and empty space left on the pages to draw on. The artworks are really nice and aimed at kids. They are a mixture of black and white line art, line art with colours, and full coloured drawings. They are nothing too complicated and anyone can just look at them and draw, either follow in style or come up with one from imagination. There are a total of 900 drawings. The book comes with a special binding allows it to be laid down perfectly flat for drawing. It's a fun activity book for kids. I read on Amazon there's a teacher who bought the book for ideas on drawing also. The author is Julia Kuo. Special thanks to Quarry Books for providing this book for review. Also check out their Craftside blog for all the interesting things about art and craft, and other Quarry books I've featured.